Instead of dwelling on their imminent death by angel, Jeep goes on to say it's time to reveal the identity of the chosen one. If there is a chosen one destined to lead the remains of the human race to victory over the angels, it seems like that information would be useful to know immediately, but instead Jeep and Michael only say they'll reveal the answer "soon enough." I can't decide if this is another cliche or just terrible writing, since it makes very little sense, plot-wise, to say "I have crucial information to the future of humanity, but I can't tell you just yet. And I can't tell you why I can't tell you. And I can't tell you when I can tell you." And now because this seems like a great idea -- and also Whele insisted they carry on -- it's time for the city's Jubilee, an extravagant pageant surrounding a gladiatorial combat ring. Whele kicks off the party by announcing the engagement of William and Claire, which comes as a surprise to Claire -- but not her father. This is strike two for our lovebirds. Whele follows up by releasing an angel -- the last of the three that had been chasing Alex at the beginning of the episode -- into the ring. Surprising no one who's watching -- though Whele seemed genuinely shocked -- the angel escapes and causes a fair amount of chaos before Michael kills it. And it's not the last of the angels: more have now breached the perimeter of the city. It's enough to send everyone in a mad stampede to get out and to safety, which Alex tells Claire is the perfect chance to get away... but Claire explains her father needs her and they should to stay to defend the city. Romance really is dead when your lover wants to stay in a city that's under attack after she's been betrothed against her her will. And that's strike number three -- bye bye, lovebirds. They head into a bunker just in time to watch one of the members of the Helena delegation -- an angel in disguise -- kills Jeep. Alex shouts for a medic while Jeep, with his dying breath, says, "You're ready. I believe in you. You are the chosen one." The only surprise in this scene is the fact that Alex now has the tattoos that previously covered Jeep's arms, supposedly a sign that he is, indeed, the chosen one. Whele and Riesen argue over what's just happened, but Whele is convinced that things have worked out for the best... except for the surprise about Alex, anyway. "Vega has become unfocused and so have you. My little demonstration [with the angel] couldn't have worked any better. Now we'll all be ready for the battle that's coming." Just in case you didn't know he was a bad guy, Whele had to explain he's totally cool with angelic murder in order to motivate people... and somehow no one calls him on it or his stunt of bringing an angel into the city in the first place. Is Whele really so powerful that his fellow senators can do nothing but glare at him? Apparently so. In the end, we're left with a damaged city after one of the angels smashes into the factor that powers the city. Whele's plans to seize power are delayed with the entry of Alex as the chosen one, Riesen might be rethinking his plans to resign, and Alex is having a minor identity crisis -- not helped by his tattoos, which are telling him not to trust anyone. (Yes, his tattoos sending him secret messages is an actual plot element.) And since no one here seems to trust anyone else here, going with the advice from the magical tattoos is probably going to work. Though a last-minute twist will change the way you think of at least one of our central characters, it may not be enough to get you to tune in again next week... in which case, good luck with that, Alex. 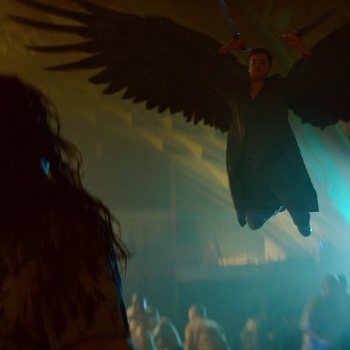 So, readers: what did you think about the first episode of Dominion? Will you be tuning in again next week?